This metal, patterned, double-holder magazine rack is in great condition. It comes from an antique collector who had no room for it! The wooden handle is not stabile; while you're carrying it, the handle will rock back and forth a bit for easier transportation. Especially handy if the rack is filled with goods! This is a gorgeous accent piece to any decor. It is like brass in color and sturdy. Nothing loose or falling off! Measurements: L 16.5" W 8" H to handle 20". This piece deserves a great home. It's super! Dessert-size 18-piece stoneware dish set from Crate & Barrel. This came from a family in Oak Park who turned them over in perfect condition after redoing their kitchen! They are deep black in color, and the mugs have a shiny, glossy glaze inside. Dishwasher, microwave and oven safe. Six each of each piece: mugs, small dessert plate/saucer and bowl (holds approx. two cups). Great for adding contrast to neutral decor! Four little mugs in a cute retro design. White with blue & sage green diamond. Each is 2" tall by 2" deep. All in great condition, no chips. Great for a small urge to drink coffee, or if you're like me, something a little stronger in the espresso range! Sturdy glass C&B vase in deep red. Light reflection in photo shows edge as looking chipped, but we assure you the piece is in perfect condition. We always check for brand labeling, and as this was purchased the seller was amazed to discover it was from C&B. Some people don't know what they have! Stands about 11.5" tall with a top diameter of 5.25". Base is slightly heavy; very unlikely to tip over! Lightweight wooden well-painted hooks in perfect condition. Great for a boy's room! Measure about 4" in diameter. These are adorable and in perfect condition. Make great gifts or shower favors! These lightweight penguin salt and pepper shakers are shiny, colorful and a perfect edition to your eclectic kitchen! They have never been used, though the box itself does show a little wear. Were only opened once to photograph. Measure 3" high. Fun, modern circle, colorful design on this 7" x 7" sturdy plastic frame. Shows no signs of use. As pictured, picture window is 4"x4". Adorable! Frame has weight to it; the tiles are ceramic. Measures 8.5"x7". Picture size is 3.5"x5". Great pastels - light green, yellow. Shows its age in a great way. Clean, no missing tiles. As shown in the photo, it is gold (paint over metal) with glass windows behind the vine cutouts. The swinging door has a small latch and the interior is big enough for a small-medium pillar. There is a small handle on top to complete the look! Inside bears no evidence of use. Stands about 7" high. Ceramic ashtray plate in vibrant colors! This doesn't even have to be called an ashtray, it's designed in a way that form far surpasses function. This would look so great on a coffee table. Bonus if you're a smoker or know someone who is - great gift idea! Measures about 11" in diameter. There are so many things we list that we want to keep; this is one of 'em! Pier 1 sold these over 10 years ago, they seem to be quite popular, but difficult to find. The tulip's green base is metal with a great antique paint job. 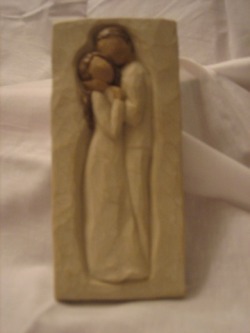 Glass top is attached and could also fit a small votive. We recommend a tealight to keep the interior clean. Stands about 8" high and is in brand-new condition. Tip: to clean out a candle holder easily without breaking it, place it in the freezer for awhile. The wax will chip right off. Try using the dull side of a butter knife so it won't damage holders. Off-white vintage handbag by manufacturer Block. Measures 7" x 9". 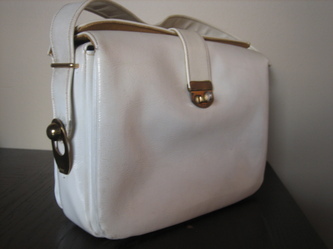 Front clasp in perfect working condition as are interior zippers. each other to cover entire purse before clasp strap closes. 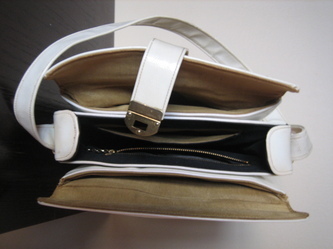 Two exterior compartments, one interior including zippered pocket. bottom of the purse from picking up and putting down. Not bad, though. fabric however bottom of one pockets has some permanent spotting/dirt.